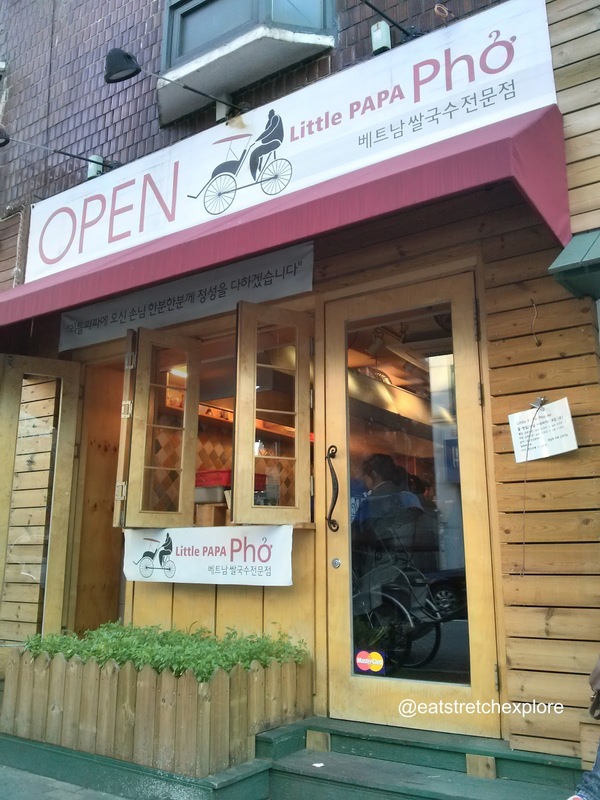 I came across Little Papa Pho in Hapjeong and I just knew I had to check it out! There are some foods that I always begin craving while I'm living in Seoul. One of those foods is pho. Sure, Seoul has some pho restaurant chains, but they don't taste very good and are way too expensive! I'm used to getting a huge portion of pho for a lot less than $10USD. Many of the chain stores in Seoul change the flavor to fit the Korean palate...and most Koreans do not like the flavor of cilantro, so it's often missing completely or used very scantily. The outside is very plain, we almost walked past it at first. However, you will definitely notice the bicycle rickshaw outside of the restaurant. The restaurant is pretty small and it's very popular. You will likely have to wait. I would recommend going before it opens so you can get in the queue. The hours are from 11:00AM until 11:00PM (when I was there, but they may have changed the hours). 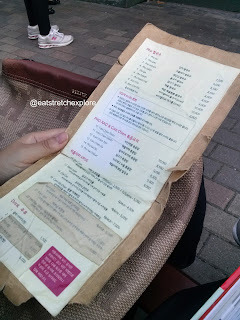 While you wait, they give you the menu to look over. There is no English menu, but they do provide the Vietnamese names for the dishes, so if you go to pho restaurants often, you can probably choose easily. I ordered pho ga (chicken pho; 8000KRW) #5 and my friends ordered pho bo (beef brisket; 7500KRW) #1. We also ordered the banh cuon (chicken mushroom rolls; 6 pieces for 4500KRW) #17. 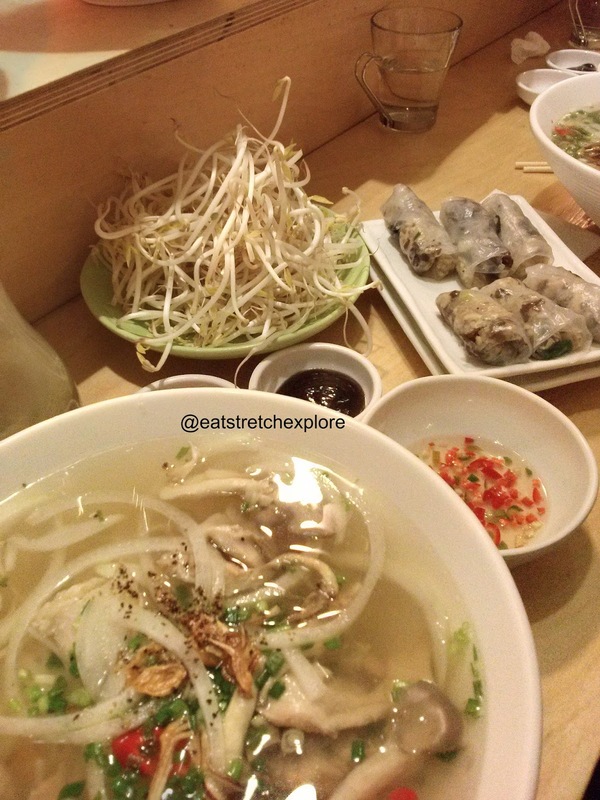 We were having a really hard time choosing between those rolls and the vegetable spring rolls (goi cuon, #16) and the fried dumplings (cha gio; #18), but chose the mushroom rolls after much deliberation. I really wanted them and this was my "moving to Japan" lunch with my friend, so they allowed me to choose. Other people in the restaurant ordered the fried rice (numbers 10-13, but I couldn't tell which one they had ordered, but I am sure it was not #10 the pineapple fried rice). The fried rice looked very good, too. 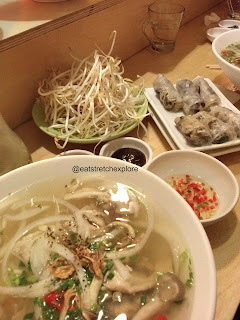 Another great aspect of this restaurant is that the food is cooked by Vietnamese chefs. You can also ask for extra cilantro and hot peppers if you want to have some stronger flavor. The pho broth was probably the most flavorful broth I've had in a very long time! It was amazing! I'm not quite sure what they did to get such flavor out of the broth, but they know what they are doing. They also do not skimp on the noodles. You will definitely be full when you are done eating! Even though my friends were slightly skeptical about the chicken mushroom rolls, they were definitely surprised by how good they were! I kind of wish I had gone to Little Papa Pho earlier in my time in Korea. I definitely would like to try some of the other menu items. Location: Hapjeong exit 5. Turn right at the first street. Follow until the first four-way intersection. You will find the restaurant on your right.